For this post I’ve picked out what I think are the most useful things to consider before you start, as well as a few things to be prepared for that can only come from having a bit of experience with it. Who will buy your work? What has surprised me is that most, if not all, of the people who buy my work are other artists. Some are professional artists, some semi-professional and some doing it for the love of it. Perhaps not so surprising, because my audience – the people I reach through this website – generally follow me for the advice and teaching material I put out, for what I share. And this is a very important point. The online audience is a very, very different audience than the kind of people who buy work from a gallery. They’re not terribly interested in your artist’s statement, or your resume. They’re people like you, and they’re interested in what you have in common: Your struggles, your process, what makes your work come out how it does. If you want to sell your work online, you need an audience – a group of people who have given you permission to contact them. Do you have an audience right now? If not, you’ll have to build one. Facebook and Instagram followers might be nice, but thats not really an audience. Very few of them will be likely to turn into buyers, and I wouldn’t call that a meaningful relationship. Mostly, people who will buy your work will be on your email list. If you don’t have an email list, this is the thing you’d need to get started on asap. Because if someone is on your email list, they’ve given you permission to contact them, and that’s a big thing. It implies trust. And responsibility, on your part, only to contact them with things that will be interesting or useful to them. How can you answer this question? I know from experience that some of you who’s work is good enough already will think it isn’t, and some who’s work I would think isn’t ready will think it is. We’re terrible judges of our own work. The only way to find out is to put it up for sale. But of course it may not sell for other reasons, like that you don’t have an engaged audience (ref above point). The upshot is that I don’t think this is really worth thinking about for too long. I didn’t think my work was good enough to sell online, but apparently it is! What kind of work sells best? Will mine? Artists have always worked to the market to an extent. Don’t be too proud. Yes, it’s wonderful to be able to follow your vision but let’s be realistic. If you want to sell your work there will always be a balance to find between what you’d most like to do and what other people are most interested in. If that sounds like selling out to you, I’d suggest that your mindset is a little too romantic for this to work for you. Equally, if you just produce work you think will sell, I think you’ll find it soul destroying pretty quickly. I know I would. Where your balance lies will be up to you to find. But this is a very democratic way to make a living from painting, and it’s likely that you will need to consider what other people like. For me, I still have no idea how well a painting will do. I’ve had ones that I thought were pretty good not sell at all, and others that I felt less confident about go for some of the highest prices. I will say this though: as well as beauty, I think people generally are more interested in pieces that evidence a certain degree of skill. If you look at the painters who do very well with this – Julian Merrow-Smith, Duane Keyser, Carol Marine – they are all very skilled painters. Remember that your buyers will probably be other artists, and that means they’re informed. Very often they’ll know the difference between a piece that’s been done well and one that hasn’t. If your process for making a painting is long and slow, your hourly rate may end up being lower than the minimum wage. For me, I’ve had paintings I spent three days on sell for $100. $33 a day is not a living wage! But I’ve also had paintings do much better than that, and I’ve found that over time, the prices they go for have gradually improved. Overall, it evens out to be worth it for me. You’ll need to keep one eye on that. 1. Sell it on another site. like Daily Paintworks, for example. They supply the audience. But you have to compete against a lot of noise. I wonder what % of works up there actually sell? And for how much? I have no experience of this, I’ve always valued my independence too much and wanted to do it for myself. But if you don’t have your own audience yet, it might be worth giving it a go to see what happens. Cons: Noise. Lots of other artists are trying to sell their work there too. You may end up paying for it without actually selling anything and making a loss. This is probably the quickest way to get up and running. You might be limited to your own country if you don’t already have rep, though. That’s why I didn’t go that route initially. But Duane Keyser still sells his work this way. Pros: It’s really easy to get going, you just need an ebay account. Cons: You still need your own audience, they won’t just sell because they’re on ebay. Duane Keyser, for example, has a big audience of his own that he contacts by email – his email list. I would look at this purely as supplying the auction functionality. You still need to do the selling part yourself. 3. Have an auction on your own site. The best example I’ve seen of this is my friend Julian Merrow-Smith’s site. His auction was custom built for him and looks beautiful, as well as working really well. If you can’t afford to hire a software developer to do it for you, then the other option is to use a plug in on a wordpress site. This is the way I do it. Cons: You have to do the tech set up yourself. It works, but it doesn’t look as pretty as a custom-made solution. Other stuff will come up I’m sure. There’ll be a Q&A at the end and I’ll do my best to answer any questions you might have about it. Oh, and I’ll be showing all the paintings I’ve sold so far and the amounts they went for. This really will be a complete behind-the-scenes peek at how I sell my paintings on my website. When: The webinar will be on Wednesday 23rd January at 6PM UK time (10 AM Pacific time, 1PM Eastern time). Just enter your email address here to register. I hope that was useful. Selling your work online is a wonderful way to earn some income from your art. 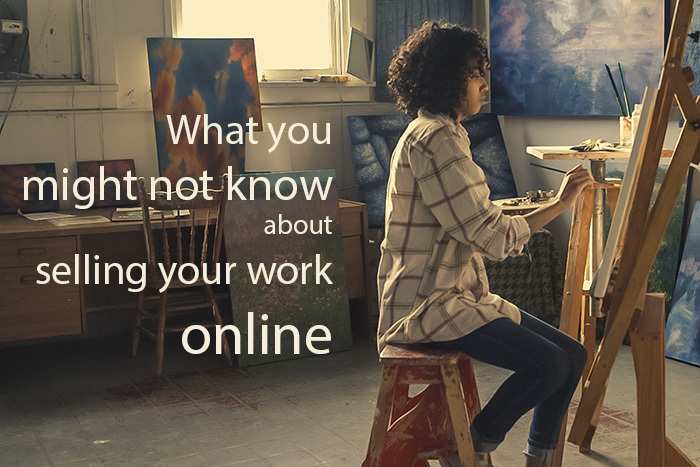 There’s a lot to selling your work online that I think people don’t really consider when they see well known online artists do it. I didn’t! So in the webinar I’ll try to share as much as I can in order to prepare you a little better for your first jump in. Don’t be shy with questions. I’m very interested in this and have been for a long time. I appreciate your generosity in teaching this. Several factors are holding me back, I’m sure fear is at the root of it all. I look forward to your webinar. Hopefully, I can still listen even if I’m not able to attend at that time. I know that fear only too well Stephanie! It lessens with time but never completely goes away, I find. Yes, the webinar will be recorded and if you register you’ll get a link to the replay, don’t worry. I’m interested in sellling online too – I’ve been with an online gallery for a while but they don’t seem to be selling much of my work these days. I’ve started a blog with the intention of building my own audience but I think it will take a long time! Hi Rosemary 🙂 You’ve done exactly the right thing, starting a blog. Yes it does take time. I could tell you it took me 10 years, which it did, but for most of that time I was learning to draw and paint and not actively building an audience. You can already paint really well! And it’s a bit like compound interest – the sooner you start, the greater the rewards later. Er… no it’s attached to my website which is a weebly one. Rosemarylewis.co.uk. I guess WordPress is better? The weebly one is pretty basic .. Yes wordpress just has more functionality available from the plug ins, many of which are free. My auctions run on a wordpress plug in, I don’t know any other way of doing it apart from a custom built one. It also gives you a lot more flexibility for how you set up and build your email list (hint: just asking people to sign up rarely works!) and that’s one of its main strengths. The email list is the key to it all. BTW I was with that gallery you’re with now too a while back (not the Studio Gallery, the other one) and they never did anything for me either. They once complained about the price I wanted to put on one painting that had taken me over three weeks (more like six if I count the preparatory drawing) because “we have much bigger paintings selling for less”. Sigh. Absolute novice at selling and it’s about time I started! The timing of your note is just perfect. Today I’ve just registered my website ArtbyKarlene.com. And my blog https://karleneellsworth.blogspot.com. I’ll be uploading by About and some my images later today. Fantastic Karlene, well done! Get all that lovely content up there. Would it be horrendous of me to suggest that a wordpress blog on your own hosting with your own artbykarlene.com domain name would be better for you? Probably my timing is terrible, sorry. But it really would be better, mostly so that Google can find and list your site. It’s MUCH better for search engine optimisation if you have your own site. Ok I just the blog started so its got my January paintings there. Great stuff Karlene, let me know how it went! I like your work better than any of the three artists you mentioned. Your style is more realistic to me. I would rather paint like you than the other artists. Thank you for your willingness to share what you know. Paul- I appreciate you so much. Thank you for this help. This part (the online audience building, the email lists, and the tech especially – MOST definitely the tech) is the most intimidating and perplexing thing to me and I’m so grateful for your generosity is sharing your experience. The tech is daunting at first I know, but it is all doable. Put it this way, it’s not as hard as learning to paint! I would be very interested in the how to’s of creating and sending out newsletters, and how you go about doing that. Looking forward to your video next week. Yes that will all be covered in depth as part of Threads. It really the engine of the whole thing, the heart of what makes an online business work. I tie what I send out via email to my blog posts. So I write a blog post on a topic I think will be interesting and helpful to people, then send out an email to let people know it’s there with a link to it. You need an email list provider to manage it, Mailchimp is good and is free to set up. I use Convertkit but that’s a bit more expensive if you’re just starting out. Sorry you can’t make it Geoff, the timezone thing does make things a little difficult! I plan to find a way to work round when I open up Threads, probably by duplicating streams once at different timezones, to try and cover it. You can always leave questions here or email me directly, too. And this one is a very good question, but it’s too complicated for me to answer quickly and completely in a comment. But I will be doing at least one live stream (probably more!) on it as part of Threads. I use a DSLR to take my photos and to make sure the colour is good I use a colorchecker classic card, photographers use them to make sure their colours are true. You then need the right software – Adobe Lightroom or Photoshop – to process the images. It takes time. The problem with taking the images on your phone is that you can’t colour correct or set the white balance. The best thing you can do to improve the photos right now is to take them with a DSLR and set the white balance in the camera before taking the shot. that will vastly improve your pictures. Also, it’s much better if you can take you pictures in daylight. Hi Paul, Another thank you for so generously sharing all the knowledge you have worked so hard to gain over the years. You are an amazing inspiration to your followers. My biggest hurdle getting out there is lack of confidence in my work and fimding time to produce enough and learn all the technical stuff to go with it. However, it am getting a new studio this spring which should give me some incentive to become more productive. I will have to see you post webinar because my timezone is just too early. Again, thank you so much! As with anything big and complicated, the trick is to decide on the next small step and focus on that. Long time(ish) no see, or so it seems. This is great information, some of which I knew from our previous discussions of course but I can imagine that if you’re coming into this fresh then there’s a wealth of useful direction in this page alone (and obviously a decade of useful information in the site). I setup my selling channels (eBay and Etsy) about 18 months ago and then at the end of last year I signed up for Shopify on the basis that I haven’t really been pushing my artwork enough and with that I’d be able to redirect my domain name there and also provide direct links on Facebook and Instagram posts. Seems quite expensive though at $29 a month for a basic package. That far exceeds anything I’ve sold so obviously I’d need to be pushing hard on the marketing, and with a heady distribution list of 19 people and a few hundred Instagram followers (that will never buy anything) I probably shouldn’t have signed up just yet. Due to personal circumstances intervening I haven’t had a chance to do anything with Shopify other than setting up the basics since so that’s $58 down the drain that’s going to take more than a few art sales to recover from, realistically I should cancel it right away. I mentioned Etsy above which I see you didn’t mention. Perhaps you’ve had experience with it and decided it’s maybe not an ideal platform. By rights it should be as it originated with hand-crafted unique goods (more crafty maybe) but I do keep accounts and thought it might be worth sharing those stats. I’ve sold ten times more on eBay than Etsy, and until the past month both had exactly the same products listed at exactly the same time and price. Whilst the eBay costs are higher, the fact is that sales have been made and you only pay when you sell. Whereas Etsy charge to list your items, after 18 months the Etsy balance was running a small loss, in other words I would literally have been better off keeping the items I spent hours creating hidden away in the drawer. It’s only a small loss but I’ve decided on a deadline of April (the two year mark) that if it doesn’t turn a profit by then, then I’ll be saying adios to Etsy as well as Shopify. This might be just my experience but if it helps anyone put some extra thought into selling platforms then I’m only too glad to share the experience. One thing I was going to ask, my blog is setup on WordPress but it’s WordPress.com – I got caught out by hearing “WordPress” and thinking that’s what I was using. However whilst it’s using their software, it’s also them hosting it and it’s very restricted in running plugins (basically you can’t) unless again, you start coughing up for an costly monthly fee. It might be worth mentioning the difference between wordpress (the software, hosted elsewhere) and the wordpress.com site which is just about good enough for basic blogging but limited for anything else. Do you host WP on your own infrastructure given your SEO background? I’m with 1&1 for the domain redirect (again, little research done beforehand) and they can provide a “Managed WordPress Hosting”. I need to figure out if that’s a good idea or not really…. As I sell/have sold very little, and initially for very little money (avoiding underselling might be an interesting subject for a future post) I’m still running a loss after nearly two years, which I don’t mind if it’s small and may lead to better things but I don’t want to go into a 3rd year thinking that I’d have been better off just filing my artwork away in the cupboard as before. Thanks for sharing your experiences with it, Steve. I think the bit that matters with all those third part sites is that unless you have your own audience it’s unlikely to work out well. The problem, as you say, is that for some of them you have to pay quite a bit up front and you’re relying on the audience they say they will provide you. I’m not really surprised Etsy worked out that way for you, there’s a lot of noise on that site! Paul – I do appreciate your comments and observations about art – and find them valid and useful. You seem to me to be a sort of “Mr. Rodgers” for adult artists – calming and instructive. I am now over 75 and have just started painting small pictures. I joined Daily Paintworks recently and have started submitting a few works. I have taken workshops from David Gray (2016) which gave me a jump start and with Sarah Sedwick (2018) which was more alla prima based – not really my speed but since I am slow I thought perhaps it would be helpful. I am not disciplined in my approach to value and color application but your videos certainly have made me more aware. I do not have a following or an audience and I am not particularly friendly so I don’t see myself developing a customer base. However, I am still interested in what you say and how you say it. I am sure many others out there feel similarly – or you would not have such a huge customer base. You are a wonderful painter and teacher. Thank you for being there and creating such an enticing view into your painting world and sharing it with others. Thank you so much for the webinar. It was absolutely informative! I didn’t get a chance to attend live but I just finished wat hi g it and thanks for the link. I have a few questions. 1. How much do you share with the audience? On a personal level there is so many deeper feelings related to painting, how I got to it, what makes me continue with it and why I want to continue painting. 2. When opening a blog is it better to use your nickname or your real name. I am a widow now. Do I use my name as a widow or my maiden name. 3. How do you overcome your fears? They never end. Sometimes, I get confused. Are they fears or just doubts about how good my work is. It is an ending self-questioning and I believe it will not go away any sooner. Thanks Again and I truly wish you the best and looking forward to the next webinar. 1. Personally I try to share as much as I possibly can, no matter how personal. Of course we all have a line we won’t go beyond. But my line has moved further and further the more I’ve done this. I believe that it’s not until we start sharing the more personal aspects of our artistic struggles (and life struggles, come to that) that we really start to share something meaningful with people. Yes, it is uncomfortable at times, but it gets easier. And when people respond positively, when someone recognises your struggles in their own and connects with you, it feels very rewarding and you know that you’ve done something useful. But you don’t have to share anything you’re really not comfortable with. Share what you can, a little at a time. See how you grow. 2. The name you use for your site is entirely up to you. I’ve used this one for years, but I’m going to move to paulfoxton.co.uk soon. It really doesn’t matter. 3. You’re right, they will not ever go away. You just get better at doing what you need to do despite them. Like anything, start small.Do something that makes you feel a little frightened and see how it goes. Then push a little further. go to the edge of what you’re comfortable with and perhaps a little further now and again, but not too far.